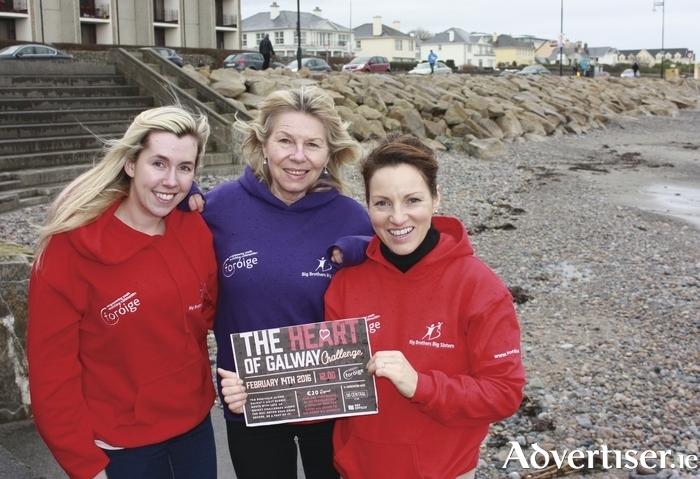 Andrea Gallagher, Kate Cameron and Mary Lynch, Foróige's Big Brother Big Sister Programme promoting the Heart of Galway Challenge Race. The Heart of Galway Challenge, which this year is raising funds for Foróige’s Big Brother Big Sister programme, takes place this Sunday, along Shop Street, the Claddagh, and the Salthill promenade, from 12 noon. The Project Impact foundation, established by Pat Divilly, and a number of other Galwegians, aims to support existing charities. Its first project is to raise €12,000 for Foróige’s Big Brother Big Sister programme. The fund will enable 100 young people and their Big Brother/Big Sister experience an adventure in an outdoor pursuits centre, with food/activities and accommodation covered. Foróige’s BBBS programme is an internationally renowned youth mentoring programme which matches a young person with a caring adult volunteer. BBBS is looking for male and female volunteers to be matched to a young person. For more information see www.foroige.ie/bbbs or call 091 - 554420. Parallel Worlds art exhibition at Galway City Library February 8th.